15 minutes north of Dunedin, Warrington is one of otago's safest swimming beaches, patrolled over summer and always popular with kayakers or surfers when the weather is rough. A short walk from the house is Blueskin bay where you can explore the many tracks or forage for cockels (southern clams) or oysters if you know where to look. A walkway below the house leads to rocks where you can try fishing or collecting paua, the kids will be occupied for days! There are many interesting drives within an hour of Warrington, the Orokonui sanctuary, the back road to Port Chalmers and Dunedin, wildlife tours of Otago Peninsula or just exploreing Dunedins many attractions. North is the coastal route to Karitane for fishing charters, kayak hires and another fantastic beach. Further up the coast is Moeraki fishing village, the well known "boulders" and a great restaurant. Within an hour is Qamaru and its historic buildings. 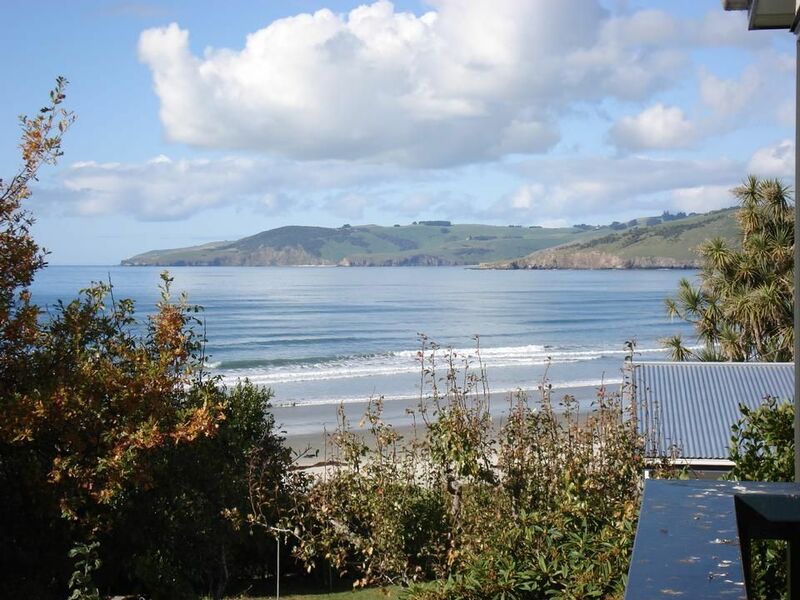 The house has commanding views over Warrington beach and all the way to Taiora heads where you can watch ships comming and going. Our "crib" is around 10 years old, it has always been used as a holiday bach and is pet friendly, it is simpley furnished, warm and inviting. Maximum occupancy is seven persons. Overnight visitors beyond this number are not permitted in or on the property. Pets may be permitted with consultation and payment of a special cleaning fee. Credit card details and debit consent may be required to cover any damage or exceptional cleaning costs. Well equipped and handy to the beach. Appreciated the bracing shower pressure. Thanks for your review, up to now we have only supplied one towel per person but we will review this in future for longer stays. There should have been two toilet rolls in each toilet, our apologies if that wasn't the case. The place is well set up and tidy, with all the basics in good condition. It is comfortable, spacious and enough view of the beach to enjoy whatever the weather. The kids loved the easy access to the beach and playground. We even saw a seal on the beach one morning. Property is easily accessible and the views and proximity to the beach are outstanding. Beautiful bach with a stunning view of the beach. Clean home with everything one could need for a holiday. Will be back! Thanks, glad you had a great time and thanks for looking after the Bach.